Today the latest KOI catalogue hits the astro-ph servers. About 6+ months of hard work to analyse, re-analyse, update, check, double check, re-check, doing it again, repeat, lather, wash the KOI catalogue came forth. You can now read about it on arXiv1202.5852. Covers KOIs found using Q1-Q6 Kepler data. Vorticity model of an exosolar planet. The planet is in an eccentric orbit and is heated by the star. This video shows how the temperature evolves on a exoplanet. This movie represents some work I've been doing towards understanding and characterizing planets orbits around other stars (exoplanets). This particular planet is very exciting. It is approximately the size of Jupiter but orbits closers to the it's star than Mercury and the orbit is non-circular (e=0.7). As a result is it heavily irradiated and continuously heating up and displaying dramatic dynamics. 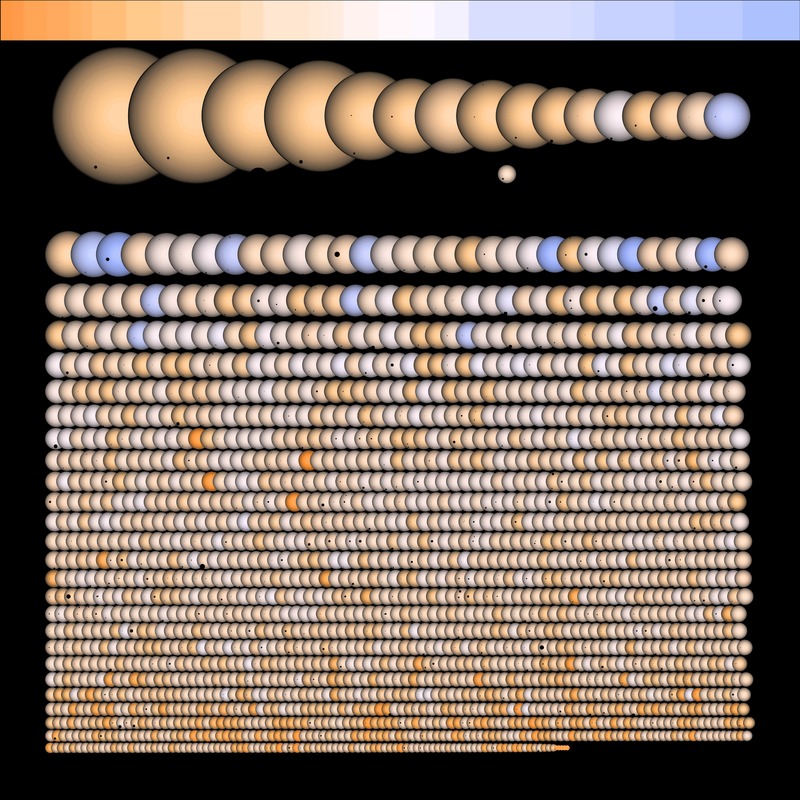 This picture shows every Kepler planetary candidate host star with its transiting companion in silhouette. The sizes of the stars and transiting companions are properly scaled. The colours of the stars are meant to represent how the eye would see the star outside of the Earths atmosphere. Stars have been properly limb darkened and the companions have been offset relative to one another to match the modeled impact parameter. Some stars will even show more than one planet! Don't forget to check out the high-resolution version, which is necessary to see some of the smallest planetary candidates.